Have you experienced your car battery going flat and your car won’t start? Isn’t it just frustrating especially if you are in a hurry to go to an important meeting or appointment? This scenario can happen to any one of us who owns a vehicle. Buying a replacement car battery isn’t the only answer to this problem. There are various methods that you can apply to fix your failing battery. In this article, we are going to see what’s the truth behind the Epsom salt battery myth. 1 What is Epsom Salt Really? What is Epsom Salt Really? Magnesium Sulfate is more commonly known as Epsom salt. It is a pure mineral and not like the salt we use for cooking. It has many uses as well as advantages, and one of those involves getting your failing car batteries fixed. Epsom salt battery recipe is a good remedy for reviving failing or dead batteries. Among the most common reasons why batteries fail is because of a condition called sulfation. This happens when sulfate crystals begin to form on the battery’s lead plates. As soon as this start occurring, it is best to do preventive maintenance. When sulfation happens, your battery won’t be able to hold its charge and eventually lose power. That’s why your car won’t start anymore. There is just not enough power coming from your lead-acid car battery to start it. As car batteries get older, it is most likely that sulfation is inevitable. However, if you perform preventive maintenance on your batteries, you can extend its life and use it for years without needing to buy new batteries. This is where you can use Epsom salt. Epsom salt mixed with warm distilled water forms a solution which you can put into the cells of your battery. This solution breaks apart the sulfate crystals that have formed onto the lead plates of the battery. It then settles down to the battery and eventually dissolves. If the process of desulfation is successful, your car battery will be able to hold its charge again and provide power to start your vehicle. At this point, buying a replacement battery for your car doesn’t have to be your only option because you have already revived your failing car battery. Using Epsom salt solution is not the only technique that you can use to fix your car battery. 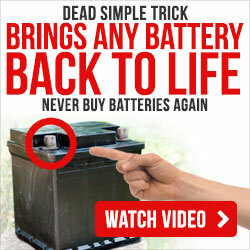 There are also other products available in the market that claim to rejuvenate lead-acid batteries. One of those is Battery Chem. BatteryChem is a good product that you can try so that you can see for yourself if it does work. When it comes to Battery Chem vs Epsom salt, both of them work just as effectively in reviving your old car battery. These two, as well as other reconditioning products for lead-acid batteries, are worth a try. They are very affordable and can work wonders for your car battery. They can add months and even years to the life of your lead-acid battery. That means a lot of savings on your part. You can check out the reviews on forums to read about the experiences of other users who have tried Battery Chem and other battery reconditioning products. It’s a worthwhile investment especially if it means saving you from the cost of a new car battery. The recondition auto batteries are a great way to save money. Imagine if you don’t have to buy a replacement battery and simply revive the old one so that it can work again and for a long time. Epsom salt is definitely cheap. Battery Chem costs less than $20. That’s nothing compared to purchasing a new battery unit for your car. Another great advantage of reviving old car batteries is that you won’t be throwing them away. This means less waste is being produced. If everyone who owns a vehicle or equipment that uses lead-acid batteries can revive their old batteries, that’s a lot of batteries that don’t end up in the landfills and pollute the environment. Batteries have harmful chemicals in them. Batteries fail every day and a lot of them are thrown out. These dangerous chemicals find their way back into our soils and poison it, contributing to the growing pollution of our world. If we can recondition our used batteries, then we are not only saving money, we are also saving the environment through our own little ways. The Epsom salt battery myth is not just a myth. It actually works, and you should definitely give it a try so that you can see for yourself the effects that it has in reviving your battery. Apart from that, there are many battery reconditioning products on the market that works just as well and are very cost-effective. (You can read one of the course review that can help you refurbish your used battery from https://howtoreconditionbatteries.org/ez-battery-reconditioning-review/). It is much better to try out these techniques in repairing your automotive battery than buying a new one. You can definitely save a lot of money in the long run because you won’t be needing to keep on purchasing new batteries for your car or equipment. If you have tried reconditioning your lead-acid vehicle batteries before, do share the steps you have taken and your experience in doing it in the comments. We’d love to know about it. If you have more questions about the use of Epsom salt in restoring your car batteries or other products for battery repair, simply email us. I will share more of what we know with you.